Introducing the new book from TheFantasySportsBrain.com: "Getting Started with Fantasy Football: From Zero to Legit in One Day." Secrets of the Pros Revealed! 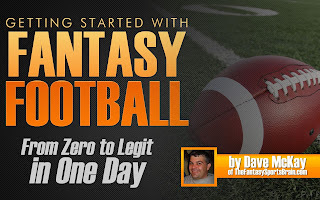 Maybe you've been playing fantasy football for a while or maybe you are brand new... Either way you will want to discover these amazing secrets. This book gives you everything you need to go from just getting started to being a legitimate competitor in just one day. Forget about merely hoping your team wins! Forget about struggling in fantasy football. Former ESPN Producer and fantasy sports veteran Dave McKay will guide you through the three parts of the fantasy football year and give you easy-to-use tactics for each. You can do this! Get started today for less than the price of a cup of coffee. Click to review before purchase.